When I first saw the trailer for In Time, I could only think, "Oh, look at this, they're remaking Logan's Run." In a way, that's true: for the basic premise of the stage in this film. 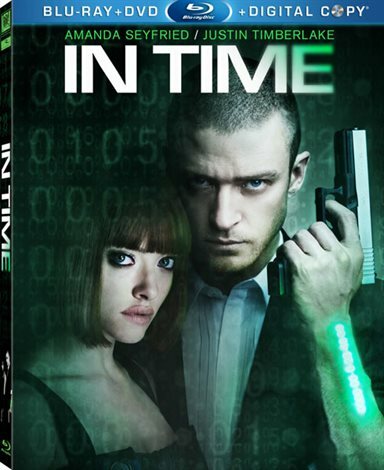 In Time is set in the future when mankind is genetically engineered to only age for 25 years. And then you get 1 year of time. Run out of time and your heart stops, it's that simple. Now unlike Logan's Run, where if you can survive Carousel, you can live, this world allows you to earn time by working, pay for things with time, and share time with others, either voluntarily or involuntarily. We are introduced to Will Salas (Justin Timberlake, Alpha Dog): for three years he has lived with usually no more than 1 day on his clock. His mother (Olivia Wilde, Tron Legacy) wants him to have a good life but there are always bills to pay. Will's life is a usual one of having to work just to keep living, until one night he runs into someone who is very rich in this world: this person has over 100 years on his clock. He tells Will that he is really over 100 years old, and he's tired of living. So while Will is sleeping he gives Will his time, and then waits on a bridge for his own clock to stop. And that is where the movie switches gears. Instead of police in this world, they have Timekeepers. Their responsibility is the same as the old fashioned police – to make sure that no one has more time than they have earned. The lead Timekeeper is Raymond Leon (played by Cillian Murphy, Batman Begins). He has been a Timekeeper for 50 years, and he thinks that Will stole the time. During this part of the movie, it's mostly like Brewster's Millions in a sort of way – what would you do if you had more money than you've had in your life? Go to a fancy hotel, buy an expensive car and clothes? This continues until Raymond finally catches up with Will. Now the movie switches gears again and turns into Bonnie and Clyde mixed with Robin Hood. Will, who we know is innocent, must now break the law to survive, and to survive he kidnaps the daughter (Sylvia Weis, played by Amanda Seyfried, Red Riding Hood) of one of the richest men in the world, Philippe Weis (Vincent Kartheiser, Mad Men). An intriguing premise behind the movie is even more shocking when you realize that the movie was made well before the Occupy movement began – yet it was released five weeks after it did. A major portion of the plot is about how a very small percentage of people in the world (I'd say less than 1%) are able to live forever because they can afford it. They make their money by getting ever increasing the cost of living from the lower class. (The movie actually explains why they have to do it this way, and I'm not going to give it away, you'll have to watch it to understand) So while it's not the true meaning or purpose of this film – it is an important subplot. If you can ignore the current political subtext with this film you will see that it becomes much more enjoyable. The true meaning of this film is simple: If you only had one day to live, how would you do it? How would you live your life? And while they don't answer it specifically in the film, the point is still delivered in a way that I was not expecting. It's not heavy in your face – the third act is more like Bonnie and Clyde/Robin Hood like I mentioned before – a lot of action with minimal plot development; but it's still there. Think about that for a while. Ignore the politics and you have a movie that rivals fun films like Bonnie and Clyde or maybe even Butch Cassidy and the Sundance Kid. The DVD comes with very little frills – deleted scenes and the theatrical trailer. The sound as expected is excellent with the Dolby Digital 5.1 mix. Download In Time from the iTunes Store in Digial HD. For more information about In Time visit the FlickDirect Movie Database.